X Factor - the ultimate in socialised TV? The X Factor TV show is producing an enormous online echo. High levels of related Searches, significant activity on Facebook, substantial volumes of X Factor blog posts, ever increasing YouTube views and Twitter dominated by X Factor discussion every week. The volume of X Factor related Google searches has been growing over time - with peaks in line with series broadcasts. 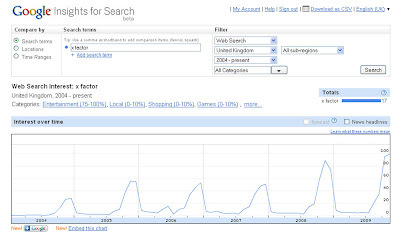 2005 grew on 2004, but then X Factor related searches stayed relatively constant until 2008 when they increased significantly. 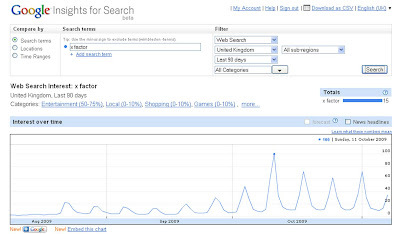 For 2009 Google Insights For Search are showing more X Factor related searching (on Google) than ever before. There are also over 500 Facebook Groups relating to X Factor, the largest being 'I bet I can find a million people who want the twins out of X Factor' with 281,055 members. Show name (twice), contestant names, judge name and 'Black Eyed Peas' after they performed, all featured in the Twitter top 10 most common phrases last night. Every week Twitter is widely used as an X Factor discussion forum, but Twitter users last night seemed even more obsessed than normal. Thousands of tweets were being posted every minute and this carried on long after the X Factor had finished broadcasting - 'Jedward' is still in the top trending topics this morning. Bil Tancer at Hitwise occasionally tries to predict talent show winners by studying Search activity, but there are now too many dynamics to interpret to be able to use internet data to easily predict X Factor winners and losers this year. 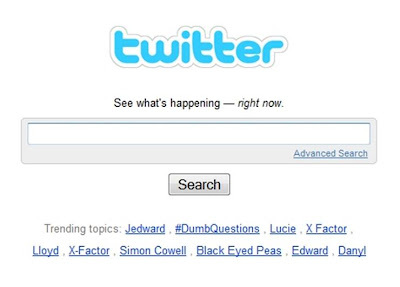 When the internet was a one way street, then Search volumes were good indicators of intention / preference. However, new platforms such as Facebook, YouTube, blogs and Twitter fuel 'social influence' and contribute to the 'cumulative advantage' dynamic studied by Duncan J Watts. Watts' argues that Justin Timberlake is a product of cumulative advantage, putting forward the idea that the 'most popular tend to get more popular' as social influence affects people's perception of quality. The herd mentality affects hits - rankings like the Top 40 / bestseller lists distort perception of quality and influence people's likes. The visibility of shows like the X Factor in social media means that using search volumes to predict winners is not going to give the whole picture. The only way to use online data to predict X Factor outcomes would be to combine Search data with real time sentiment analysis in the period between the performances on Saturday and the results show on Sunday - not easy, or particularly cheap, to do. It is clear though that compelling TV content does drive people to go online, often simultaneously - and you don't need research to tell you this when shows like the X Factor have such an obvious online echo! Malcolm Middleton and Lucky Soul - Web 2.0 vs X Factor for Christmas Number One! Jeff Buckley 'Hallelujah' - social media for Christmas Number One? Yes, the X Factor is all over social media with this series! You can also get these Twibbons (http://twibbon.com/thexfactor) to support your favourite contestant, or the show itself. A well executed social media campaign ITV. @neil As technology converges I think we'll see more socialisation of broadcast content. At the moment it's people tweeting etc on one platform, whilst watching broadcast content on another. Once any screen can offer the same capabilities (IP enabled TV's are coming, gaming platforms can show Sky and also tune into Facebook / Twitter etc) then I think interactive / broadcasting could become the norm. and for everyone else, I like he X Factor and Simon Cowell!